The wait is over: the first big PS4 game of 2014 is here. 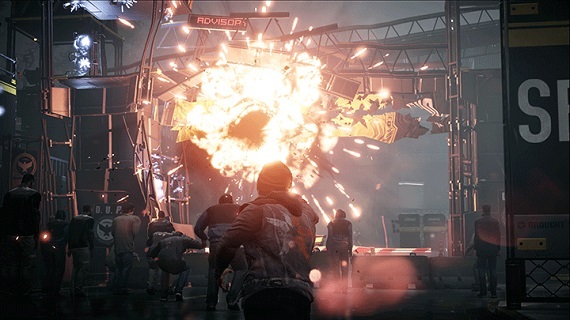 inFamous: Second Son, developed by Sucker Punch Studios, is the third entry in the franchise and a showcase for the power of the PS4. With a new protagonist, setting and graphical capabilities, inFamous: Second Son is a delight to play from beginning to end. 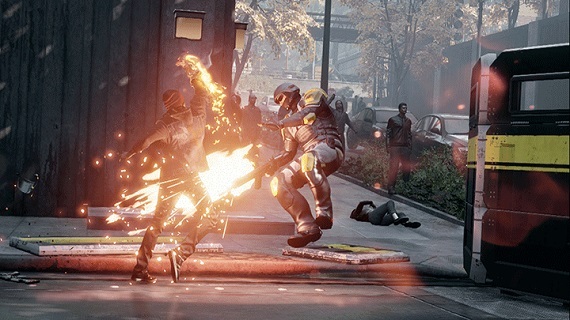 inFamous: Second Son takes place seven years after the events of inFamous 2. Following the events of Cole McGrath’s sacrifice the people began turning against Conduits. To counteract this growing fear the government created the Department of Unified Protection (DUP) to hunt down and capture Conduits. The story picks up with Delsin Rowe, a delinquent Akomish Native American whose life is forever changed after meeting an escaped Conduit. He discovers that he himself is a Conduit after absorbing the Smoke powers of the escaped Conduit. A series of events take place that sees him travelling to Seattle, Washington with his brother Reggie to hunt down the main antagonist, Brooke Augustine, and absorb her powers. Second Son’s story is easily the weakest aspect of the game. It’s not bad, but it’s extremely simple with few twist-and-turns or emotional moments. Only two moments, both towards the end of the game, came close to capturing the best story elements of the first two games. It also doesn’t help that Delsin just isn’t a good protagonist. Arrogant, rude and always cracking lame jokes, he’s the type of character commonly seen in games, complete with poor execution. Delsin doesn’t grow until he’s forced to at the very end. This is in contrast to Cole, who had major character arcs in both inFamous and inFamous 2. Supporting characters are a mixed bag. Boring and over-serious, Reggie is a poor Zeke stand-in. Your two Conduit allies, however, are very interesting with their own tragic backgrounds; plus they don’t fight as much as Nix and Kuo did in inFamous 2. 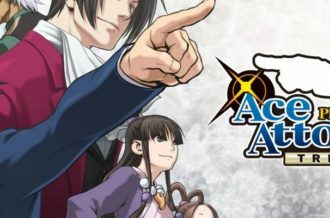 Augustine had the makings of being a great antagonist like Kessler and the Beast, but the game doesn’t give her time to develop. You don’t learn much about her until the very end of the game where her whole backstory is revealed. What inFamous: Second Son gets wrong with its narrative it more than makes up for it in its design and gameplay. It’s is an addicting game to play that gives us a good look at what a next-gen open-world game can look and play like. Fundamentally, the gameplay is very similar to the previous games. It still functions like a third-person shooter with Delsin able to fire shots, missiles, grenades and bombs with a little bit of platforming mixed in. However, the gameplay for the franchise has never been deeper. Delsin’s Conduit ability of absorbing other people’s powers opens up all new ways to play the game. 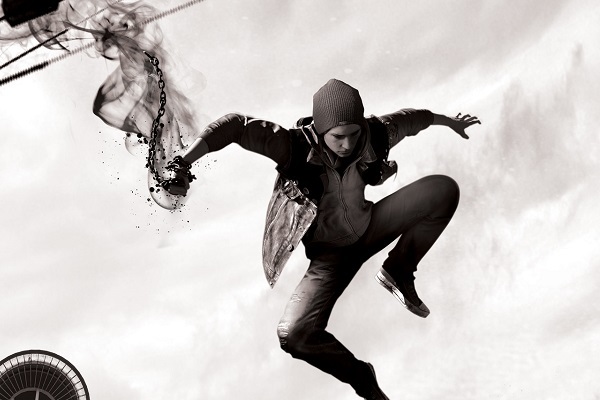 There are a total of four powers Delsin gets in the game: Smoke, Neon and two others that I won’t spoil for you. All four function differently and are equally useful. Smoke acts similar to a pistol and shotgun delivering strong, single blasts. Neon is more like a sniper rifle, slowing down time to deliver more precise shots. The different powers also affect the platforming, making it easier to travel over the vast landscape of Seattle. Smoke allows travel from the bottom of a building to the top through vents, meanwhile Neon allows Delsin to run up the sides of buildings and dash through the streets for short periods of time. It’s actually a lot of fun to stop what you’re doing and utilize the different powers to run around Seattle. This all adds up to very entertaining combat. The game starts off easy with enemies only utilizing guns, but quickly evolves with more dangerous enemy types that really test your reflexes. If you pay attention you can utilize Circle to dash out of the way; if not you’ll take some damage. 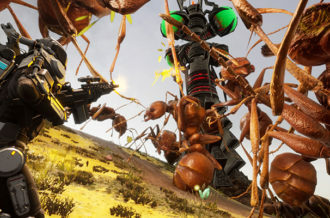 Encounters later in the game mix-and-match different enemy types to keep you on your toes and ensure that the gameplay never becomes repetitive. If there is one problem, it’s how you switch between the different powers. You have to find the elements in the environment and absorb them to switch. This presents a problem, especially with the last two powers as they aren’t encountered as much in the environment during battles. It probably would have been better to just have a button that cycles through them. Thankfully, there’s a wide variety of missions to play through. Seattle is broken up into districts under control of the DUP and it’s up to Delsin to remove their influence by destroying command centers, painting graffiti, destroying cameras and taking out undercover agents among other activities. There’s quite a lot to do in the game. If you want to rush through the campaign you’re looking somewhere between 10-12 hours. If you stop and actually go through the side content then you can easily double that number. 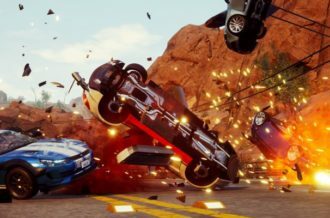 Sucker Punch does a lot of things with the new DualShock 4. 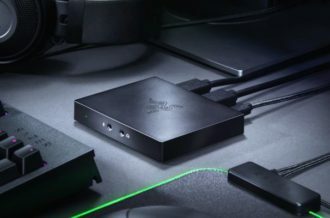 Obviously, Sony is pushing the new, unique features of the controller and they actually work well here. The TouchPad is put to use frequently; you’ll need to press it in order to absorb Smoke, Neon and the other two powers. Every now and again you’ll find some context-sensitive action that requires a swipe. It’s very responsive and never once took me out of the action. Probably the coolest use of the controller is through the graffiti missions. Using the accelerometer, you control the aim of the spray paint. It’s a small addition, but it was fun. Morality makes a return, but it doesn’t work well here. The system is similar to the previous games is that there’s only a good or evil choice, no in-between. That’s not really a problem because morality in the inFamous franchise was never meant to be a big deal like it is in a game like Mass Effect. 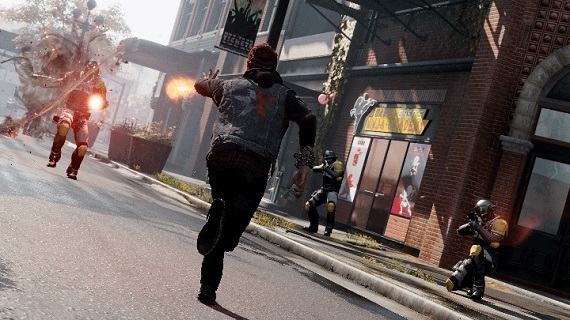 The problem is that the moral choices in inFamous: Second Son don’t really change anything. In inFamous and inFamous 2 the moral choices had a huge impact on the story and the powers Cole got. Essentially, the choices ended up making Cole feel and act like two completely different people depending on the actions he took. inFamous: Second Son doesn’t have this. There are a few ability differences, but not enough to make it feel like you’re playing a different character. Likewise, the story barely changes and there are so few choices to make. It feels like the whole morality system was just an afterthought in this game. The game plays as well as it is gorgeous. inFamous: Second Son always looked impressive at preview events, and the final product looks just as good. Second Son is a feast for the eyes and ears and is easily one of the best-looking games to date. Sucker Punch has packed the game full of detail. The streets bustle with life, trees sway in the wind and DUP structures crumble underneath your power. There are even reflections in the water and glass, and it doesn’t look bad. It’s easy to see why Sucker Punch chose the four powers they did. All of them show off fancy new particle effects that aren’t possible to create on the less powerful PS3 hardware. Each power looks different and animates beautifully. Some of the stuff that Sucker Punch is able to pull off with the PS4 architecture is just incredible. inFamous: Second Son also sounds great. The voice-acting is well done even if the script isn’t that great. 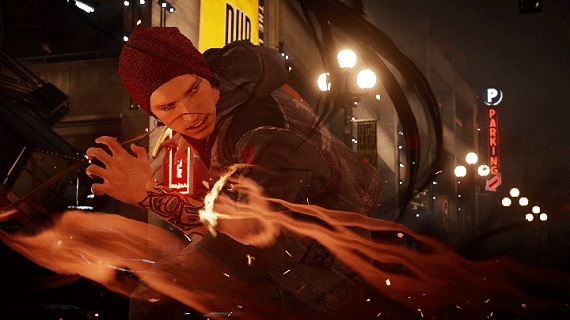 Troy Baker (Delsin) doesn’t deliver an award-winning performance, but it works for the character Sucker Punch built. 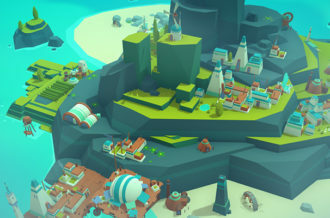 There were a few presentation issues throughout the game that are pretty typical of open-world games. Clipping and some weird AI behaviors were pretty common during my playthrough. However, I didn’t notice any framerate drops or screen-tearing. Overall, it’s a well-running game with only a few slight issues. 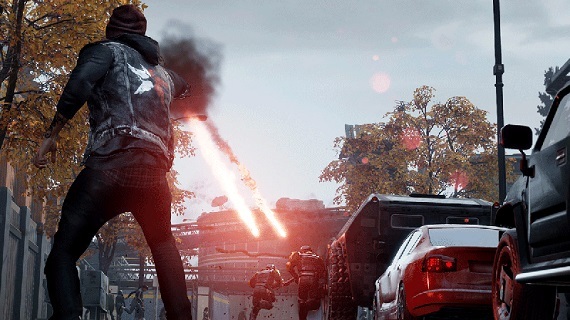 inFamous: Second Son is the first next-gen game that signals we’re in a new generation of gaming. It isn’t just the amazing visuals that make inFamous: Second Son feel so good, but also the varied gameplay and rich open-world of Seattle. The story and morality system may not be up to par with the previous inFamous games, but Second Son excels at everything else it tries to do.